Easter is the Christian religious festival that marks the crucification and resurrection of Jesus. It is observed by Christians around the world, but for many people is also a secular holiday. The date of Easter moves from year to year (and differs between Western and Eastern Christianity) because it is calculated according to a complex formula related to the Jewish Passover, and the Jewish is based on lunar rather than solar cycles. Figolla - This is a famous Maltese recipe. It is a biscuit, coated with icing, and stuffed with sweet ground almonds. It usually made into shapes such as a fish, a lamb, a heart, etc. Paska - This is a famous Ukrainian recipe for sweet bread. 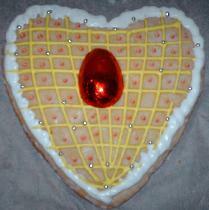 It is made from a containing butter, eggs and sugar as well as flour, and is glazed with egg and water. The inside of the bread is yellow and white, the yellow is said to represent Christ, and the white to represent the Holy Spirit. Amish cuisine contains a similar recipe, also eaten at Easter, and also known as "paska". Sarmale - This is a Romanian recipe for cabbage rolls. The rolls are stuffed with ground meat, rice, and onions. Sarmale are eaten at Easter and on Christmas Eve Serbian cuisine has a similar dish, which is known as Sarma, and is also eaten at Easter and Christmas Eve. Sarmale - This is a Romanian recipe for cabbage rools. The rolls are stuffed with ground meat, rice and onions, and are often eaten at Easter, as well as on Christmas Eve.